Engineering education includes Scientific, Technological and technical aspects. It is essential to understand the importance of different fields of engineering. For this, Arya College of Engineering and IT is going to organize a National Motivational Lecture by Shri Pawan Sinha in the guidance of Mahamana Malviya Mission on 31st March 2018 at Arya 1st Old Campus. He is well-known as Astro-Uncle among the youth. He believes that “Spirituality is essentially functional to serve mankind, as it is the first Step towards spirituality & Samadhi is the last one. so come let us start with the service of mankind”. Mr K.K. Prashar: Supervisor of Malviya Mission, Er. 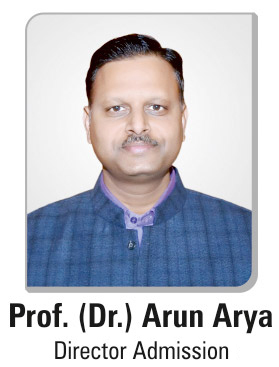 Anurag Agarwal: Chairman of Arya College and Mr Neeraj God: General Secretary of Malviya Mission will address the event with their presence and participation. The spiritual teacher, astrologer and social activist will lay a great emphasis on stress management and concentration of students along with peaceful and successful life with the learning of Geeta. It is not only the lecture, but he will have the one-to-one communication with the students and solve their queries regarding low memory and disturbed concentration, as our mind is responsible for the ups and downs of our mental status. So clearing the doubts and stress is important for everyone. This lecture will help the students in doing so. He is also a commentator on youth issues. Arya College believes that the issues related to today’s generation must be solved so that they can concentrate fully on their studies and will become highly able to achieve their goals. The Astro-uncle of youth will guide the students about various policies and rules that need to be implemented for youth. These policies will include the rights that each citizen or youth has by the government of India. He will also guide the students about various astrological remedies to get into the college. These remedies will be very helpful for them in deciding future career of their own, family and for the whole society. He will help students in making their mind balanced through several activities during the time of lecture as nothing else can give an honest, peaceful and developed society.